So occasionally, the Pittsburgh Happy Hour goes on hiatus and we take trips to eat at the most popular restaurants around the country. While we were visiting our good friend Sam in Arlington, Virginia we decided to stop by Ray's Hell Burger. I had heard that Ray's was good enough for president Obama, which kind of surprised me as the establishment is a simple, strip mall, cash only kind of juke joint. I'm not saying the president is beyond eating at simple restaurants, but if I was president, and wanted a burger I would just have the five different white house chefs cook burgers and eat my favorite one. Rays is very charming and the menu in particular is rather original. There are about fifteen different cheeses to choose from and ten different non traditional burger toppings such as charred jalapenos and cognac and sherry sauteed mushrooms. I went with the diablo style with roasted garlic and muenster cheese. It was not the best flavor combination, but I honestly have no room to complain about my poor decisions. 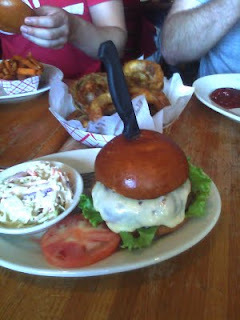 The burger was very good, but not the best I've ever had. The meat didn't have the crunchy outside char I so adore, but was otherwise cooked exactly right. If you are craving a burger in the Pittsburgh area, I'd honestly say that the Kaya burger in the stript district or Wingharts in market square are on the same level as Rays, minus the creative menu. As a side note, Ray's Hell Burger had the best onion rings I think I've ever had, and I don't even like onion rings.